There are many different kinds of RVers/campers out there living full-time, some-time, part-time, and weekend warrior style in their motorhomes, travel trailers, pop-ups, 5th wheels, stealth vehicles, tents, and more. Some travel for work each year, some are retired with pensions looking to live a more stress-free life, some are snowbirds, and others choose the RV/camping lifestyle due to financial setbacks and the economy. 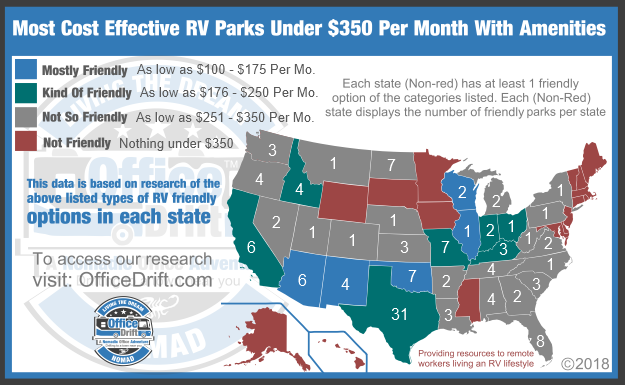 This list of RV parks with amenities under $350 per month (Between $100 to $350) is for those of you on a very tight budget, needing to come off the road a while, or maybe even stay somewhere long-term to build back up savings. The reality of the RV/camping dream is that the term is overly hyped in order to sell a service, product, eBook, or membership. It’s pitched in a way that stimulates the human brain to visualize adventure, excitement, travel, and cheaper living. Many new RVers/campers jump into this lifestyle without fully being prepared for some of the unexpected costs that go with it (Maint./Repair/Health/Etc. costs). All it takes is one high dollar repair/doctor visit and it could send you down a spiral to a zero balance financially and leave you stranded somewhere you didn’t want to be. The good news is that we understand situations like this and put together this resource to help those of you find some creature comforts that are more affordable across the country so you can take a break for a while and save your emergency/retirement cash back up, before hitting the road again. Or maybe you need time to save up and buy solar panels to be able to boondock somewhere for free in the future. Staying at cost-effective parks could be a solution to faster savings so you can make that happen. Note: All rates were accurate at the time they were added to this list and may vary. Please call parks ahead of time to make sure they aren’t closed for maintenance, changed policies, or raised rates. Pet acceptance upon individual basis per park management. 60 spaces all with sewer, water and power hookups in a secure fenced desert environment. Rental units are available for daily, weekly or monthly rental. Fully tiled pool (not heated), and heated spa, tiled restroom with showers. Laundry facility. Clean and well maintained RV sites. Large fenced pet area, horseshoes, playground, RC Challenge Course and group fire ring. For our guest with off-highway vehicles (OHV), we have a gated OHV entrance to an idle in area inside the RV Park/ See RV Park map.There is no riding to the site. Easy riding access to the Ocotillo Wells State Vehicular Recreation Area. Maps and information available. Jeep Tours & ATV rentals available nearby. Cell phone “hotspot” at the office. 30 x 70 ft Grass Pull Through Sites This year the grass is great. Many guests in Bare Feet! Sure makes us feel good to see that! Tent Sites – Group Site – Remote to the road and Hillside with a view! Laundromat (currently construction, instead we offer to wash and dry/fold per your instructions. A lot of our guests are retired. Many with medicinal needs. We provide a safe and secure temporary home, away from home! Computer Friendly – Wifi Enabled – Use your computer in your rig: Also we have a Book Exhange where you might find a good paperback read! Pet Friendly We have over over 30 acres to walk your pets and our neighbor is The Modoc National Forest. 105 (60 sites with 50 amp and 45 sites with 30 amp) sites located on 35 acres. Lots are oversized 50 x 100. Most sites are pull-through and beautiful oak trees shade some. All lots are full hookups. Clean, modern bathrooms with hot showers are provided for your convenience. Club house, equipped with game tables, darts, pool table and a full kitchen. Weekly potluck dinners, cook-outs, coffee and donut times, Bingo nights, jam sessions and karaoke. You are welcome to join in planning our monthly activities and fun times. Outside activities include horseshoes, shuffleboard and sightseeing day trips. A half-mile walking trail surrounds the park. Webster Flea Market is just 10 minutes away. Mail is delivered daily from Center Hill and placed in boxes for pick up by our members at their convenience. Plenty of room for big rigs. Loads of river frontage for all your fishing, kayaking, boating, and swimming!! Pets ok, but some breeds are restricted – please ask. 6333 Nevada Hwy. 95 N.
FREE full breakfast each morning included in the price (cabin guests only). Paved roads and pull thrus up to 100 ft.
Pets welcome on a leash, please clean up doggie deposits. Golf course just 2 miles up the road. Community barbecue / fire pit. Repairs to your RV or Tow vehicle available on-site using professional service personnel. Sites 21 trough 38 have plenty of room to park RV, Boat and your Vehicle on your site. Short distance from major grocery and retail stores, resturants, and medical facilities. Available to RV clubs and rallies. Longterm Cable/internet available via ETEX Comm.. Horse friendly with horse pens near your RV for you. Play ground area for the kids with over half a dozen large pieces of playground equipment. Newly renovated game room, complete with arcade machine, coin-oprated pool tables, claw machine, change machine, jukebox, television. Workout area with punching bag, weight machine, and treadmill. Only 15 minutes away from the rustic town of Wytheville, which offers shopping, museums, coffee shops, and more. Stocked fishing pond – catch and release. 212 East Grand Coulee Ave.
Full service includes: water, sewer, garbage, electric (30A) cable TV, Hi-Speed Wireless Internet. There are many pull-throughs available as well. Coin operated hot showers, on site. Open to the public. Coin operated Laundry Laundromat, on site. Open to the public. There are plenty of shade trees! Gas and Diesel just a half block away. Propane is available on site. We have several tent spaces available.